Great location and helpful staff. The sites in the new section have large, level pads. One of the better famcamps that we have stayed at. A decent park for a short stay. Good pull-thru sites. Close to commissary and BX. Nice pull through sites. Close to beach, resturants and an outlet mall. Small commissary and BX on base. Gas station carries diesel. Not far from a large commissary at Kessler AFB. Cable and wifi are reliable. Clean laundry facility. Trains! Trains run several times a day on nearby tracks. Horns blaring. We got use to it. Sirens! Emergency vehicles run frequently on a road just outside the fence. Got use to them too. We have been here for 45 days and it has been a wonderful stay. The park is great. It is clean, roomy side to side and front to back and each site has its own grassy area. The ‘yards’ are meticulously maintained as is the whole park. The sites are concrete pads and the roads are asphalt. Nice, wide roads and deep sites. Wifi is good. The speed is good and we didn’t have any problems with it. The Verizon cell signal is strong and, because there are no trees, our satellite dish zoomed right in. The staff at the office are great. The park (base) is only about 6 blocks from the beautiful Gulfport beaches and there are a lot of restaurants and just about anything else you might need. Now here’s the bad news. Trains! Each day/night there are about 3 to 5 trains going through town and they blow their horns as if they are going through a school yard. There is a little traffic noise from the road to north side, but it isn’t too bad unless there are emergency vehicles. And, there are emergency vehicles in this area often. All in all, we would stay here again and again. This is our first time at this facility and I'd say won't be the last! What a great location! There are miles of beaches nearby and not even close to being crowded. And even if one section were crowded, you just head west or east and find you a spot! The restaurants are great, plenty of seafood and fishing, the people are friendly; it's just and all-around great place to visit! Now for the park: Location: As I said, brilliant! Great location; I-10 is just a few miles north of the park, too. There are two parks, the older park beside the cemetery, just inside the gate; and a newer park at the back of the base by the lake. Cleanliness/Hospitality: The office staff have been friendly and helpful; the Men's Room was a bit dirty on arrival, but has been spotless thereafter. Amenities/Facilities: All amenities are well serviced and maintained. Laundry facility is great ($1.50 to wash and dry one load, for us). The NEX, Commissary, and NEX Gas/Convenience store are easy to find with helpful signage, though there are towards the back of the base. Value: Considering how civilian campgrounds gouge you for $40-60/night, these days, it's a spectacular value... Overall Experience: Awesome! One note: we stayed in site #12 in the old section, just inside the gate, and it floods when it rains. So, does site #11. It eventually drains and dries, but just know that if you get either spot, it will flood when it rains (an inch, or more of rain). The base is easy to find and the older park where we have visited on four occasions is just inside the gate. The sites are roomy and level, the park is clean, and office staff friendly. Shields is not in a rural location so normal city noises are to be expected. Granted, there are rules and regulations applicable to the base and park; however, we are grateful to be guests of our military installations and appreciate any regulations that apply. When approaching the gate wait for the sentry to wave you up. They will indicate the easiest pass through for you. The only item that could make this a 5 instead of a 4 is to have a little gathering room for folks to meet. 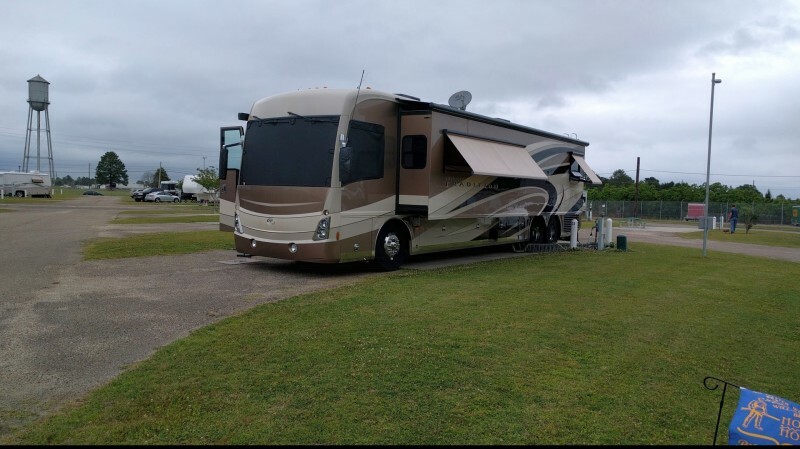 Shields RV Park is located on the Navy Construction Battalion Center in Gulfport, at the end of Pass Road. We came from the East, Hwy 90 which was a beautifully scenic road, on the water! We had no problems traveling this road in our Class A RV with toad. Once in Gulfport, we turned on 33rd Ave and then looked for the Burger King on the left, a small NCBC sign is seen on the right. At this intersection we turned left onto 25th St. which is Pass Rd. NCBC gate is at the end of this road. Entrance to the gate included temporary barricades. Essentially, you come up to a stop sign and wait for the sentry to motion for you to come forward. We presented ID and were told how to get to the RV park office. The older RV park is located to the right of the entrance gate so you can't miss it. Signage was good. We stopped near the office and checked in. There were two people working. We received materials on the campground as well as the community. We also paid a $100 refundable deposit for a cable TV box to use during our stay. The box included a remote with batteries (that worked!) and an informational book with the phone number to call to activate the service. This entire process took less than 30 minutes and we had several hundred (yes, hundred!) channels! We were pleasantly surprised. Our reservation was at the older RV park. This park has really spacious campsites with a concrete pad to park the rig and paved entrance and exit to the site. It also had a picnic table in good order. Almost all of these sites are pull through. Only a few in the very front of the park are back in. Rules for the park are clear, though, that you cannot have anything in the ground (no tents, stakes, etc.) and your slide outs cannot extend beyond the concrete pad. We saw a few minor violations, but, for the most part, this park seemed to be well managed with rules enforced. The older RV park has great open WiFi and our Verizon service was excellent! It is noisy, though. This park has a graveyard on one side but also has a heavily traveled road on the other. An active railroad track is close by and the Dole distribution trucks are across the road. The hospital is also close by so we heard ambulances, fire and police sirens most nights. We also heard trains every day and could noticebly smell exhaut fumes from across the road. We visited the newer campground just to see the difference. This campground is located across the base and I would think, based on what is around it (golf course, dog park, walking path, woods), the noise level is probably minimal. The sites are closer and they are all back in. The campground seemed well kept overall. Each site had the same concrete pad and was paved. We attempted to check WiFi speeds but were unable to do so. The base has a nice fitness area, indoor pool, commissary, and other amenities. We were pleased with the overall experience at this campground. Because we stayed seven nights, we paid $19/night, a great deal for full hookups and better than expected cable! The local area of Gulfport and Biloxi were nice. Getting back to Hwy. 90, we enjoyed the beach and a Veterans appreciation lunch at one of the local casinos on Monday. We did not gamble (no interest in that), but we did enjoy a BOGO lunch buffet there. We enjoyed local farmers' markets, purchasing local honey and enjoying the history of the area. Memorials from Hurricane Katrina devastation are present throughout this area. We enjoyed our stay and I could see us going back in the future! We also made great friends and met "Libby," who is a spitting image of our schnauzer, "Lizzie." We have stayed at this base several times in the “old park” so decided to stay in the “new park” this time. The additional park is located towards the back of the base and is very quiet. Park is in a nice location close to the large dog parks and lake. The sites in the new park are all back-in and much smaller than the older park. The interior roads are also not as spacious. This newer park has fewer sites than the original. Next time we return we will go back to the original “older” park just because of site size and space. No cable but our satellite worked fine. Free wi-fi that I felt did not work as well as in the other park. Great facility to go the beach or the casinos. Small commissary and exchange on base. Office staff is very friendly and helpful. We stopped at this campground on our way to the Natchez Trace Parkway. Very nice installation, Exchange, and Commissary. We called and made our reservations. We arrived early afternoon and were assigned a pull-thru site in the old section near the front gate. The only complaint would be the noise from trains and sirens. Not that the installation can do anything about it as all these sounds are from off the base. Just be aware if you are a light sleeper and plan to have your windows open. Adequate laundry, the shower/restrooms could certainly use a good cleaning, a bit funky for me, although I did not use the showers or laundry. 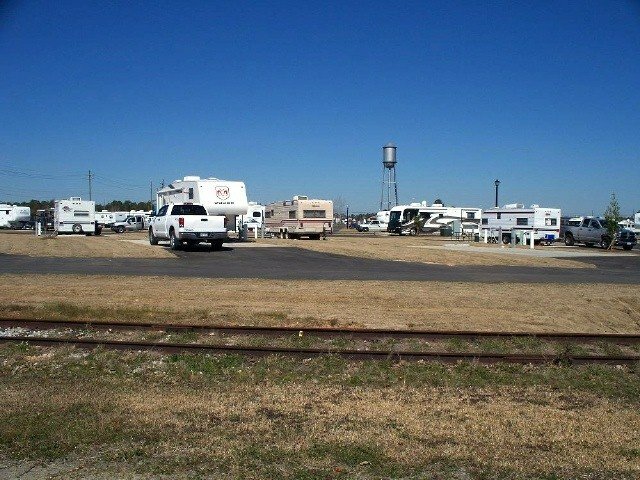 Very nice rv park, clean, well maintained. Lots of rules but it seems to work well. 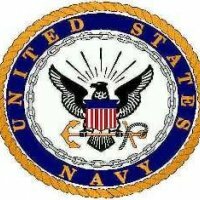 Stayed for Seabees Day. Fun event. Shields RV Park is actually two parks. The older park just inside of the main gate and the newer park on the far side of the base. Edward was very helpful on the phone when trying to make a reservation. Wanted to have access to internet (medical reasons) and he told me only the old park had Internet connections. Unfortunately there were no openings in the old park on the date of my arrival. So Edward put me in a site at the new park for the first night and into the old park for the remainder of my stay. Facilities were very clean and I only interfaced with Edward and he was exceptional! According to Edward, eventually the new park will also have access to the Internet, it is just taking time to set it up. The antennas are in place and just waiting for the service to be connected. I will be returning here as I really enjoy the Gulf Coast. Hopefully by my return the new park will have wifi as I do like the location of the new park better than the old park. The only negative I have is the cable system they are using. They have cable one and you must use one of their boxes to have cable. Then you must re-cable your wiring to facilitate their box, then call a number to activate the box. Cable one's tech support is horrible and you are put on hold forever. Oh, also there is also a $100.00 deposit on the box (returnable when you return the box and all of its parts). I recommend this park highly and will definitely be back. Our second time to stay here, great campground. Diana and Edward are very friendly and helpful. Will return as often as we can. Regarding a previous review, pet animals (dogs/cats) are allowed in the concrete block rest room building during severe weather but they must be leashed & under control. Diana, the RV manager was very polite and helpful when we checked in. Edward was helpful during the next week when Diana was out of the office. The new RV park at the west end of the base is now open and is very nice. During our time here there were maybe 4 RVs at the new site. The new park does not have WIFI. We spoke with the base commander (a Captain Hansen) at the commissary and she told us that due to budget constraints there is no WIFI at this time. But, if we were to stay here again (and we would) we opt for the new sites (quiet). The front RV park (just inside the gate) is somewhat noisy (trains, ambulances, fire trucks, police sirens and regular traffic). The fitness center is well stocked with various equipment and the outside lap pool was open. The base has a small club just inside the gate called Anchors and Eagles (in the Navy Gateway) but it's only open Tues, WED and Thurs. On the weekends we rode our bikes around the perimeter of base (2x around is about 12 miles). 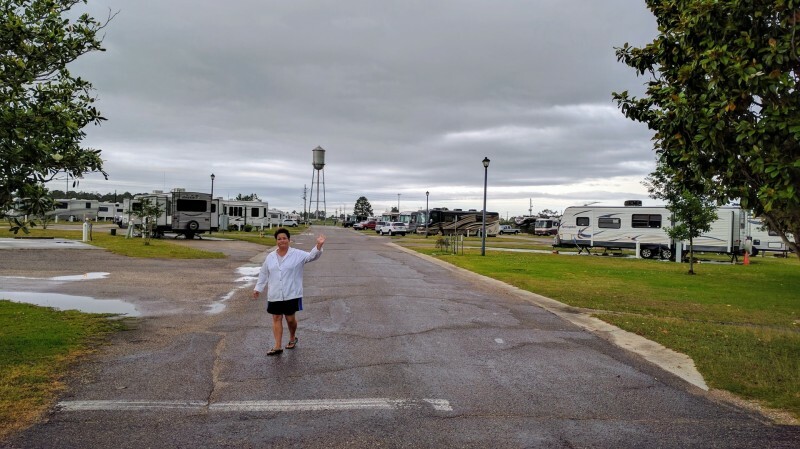 We were not concerned about activities at the RV park because we usually do our own touring while staying on military bases. We recommended a visit to the Maritime and Seafood Industry Museum in Biloxi. This was our second visit. We enjoy staying here when going west/east on I-10. I concur about gps goofing us up - go to main gate (off 25th St), you can see park off to your right. Being told we could not take pets if directed to shelter is disconcerting. Always cool and windy when we pass through, but do appreciate pavement/concrete sites throughout. We definitely make a reservation during snowbird periods to get a site. Enjoy the area! Great group of recreational/social pickleballers (many military retirees) at two locations. http://www.usapa.org/places-to-play-pickleball/ We did not use restrooms/showers/laundry. We stayed there for one night on our way to Florida. We found the facility to be very nice. The gps coordinates took us off I-10 (west bound) too early, but other than that there were no problems. If we go back via I-10 to our home in the West, we'll stay there again. We didn't have a bad stay and would go back. HOWEVER, there are limitations to the place. I love the Gulfport/Biloxi area. There is lots to see and do there especially if you are a casino lover; there are several within a 20 mile radius. We found southern hospitality, both on and off the bases (NCBC & Keesler AFB) to be truly endearing and memorable. For us Yankees our first Mardi Gras was a real hoot! Great food and the beautiful Gulf. It was decent to walk the dogs around the perimeter of the park and the dog park on the other side of the base was nice. Both of the bases have decent Exchanges and commissaries as well as the usual Thrift Shop, Auto Hobby Shop, gas station, etc. The limitations of life at Shields RV Park are the (afore-mentioned) Warden and the lack of organized activities for the campers. The staff did make attempts; Christmas and Super Bowl Parties, but for the most part you are pretty much on your own. Campers were trying to gin up activities like going out for Taco Tuesday, an occasional breakfast, etc. And when the weather cleared folks were out and about more and friendships were formed. Camper Max will gladly help you repair things and his dog Boo is always friendly. It would just be a better place if there were more organization and group activities. As for The Warden: There is a real problem w/ customer service there. We usually got the feeling that we were bothering her if we had to go to the office for something... anything! At times it seemed like the whole park was her personal giant-sized chess board. She sure did a whole lot of moving units around; SEVERAL people we met were required to move to a different site at some time or other during their stay. It's bad enough having to move a motorhome, but a major pain to do it with a 5er or a TT. Two couples we know ended up being in at least three different sites during their stay and in one case the site they had to vacate sat empty for four days before another unit moved into it. The other side of the coin for the staff is Edward. He's wonderful, helpful, efficient, caring, and lots of fun. 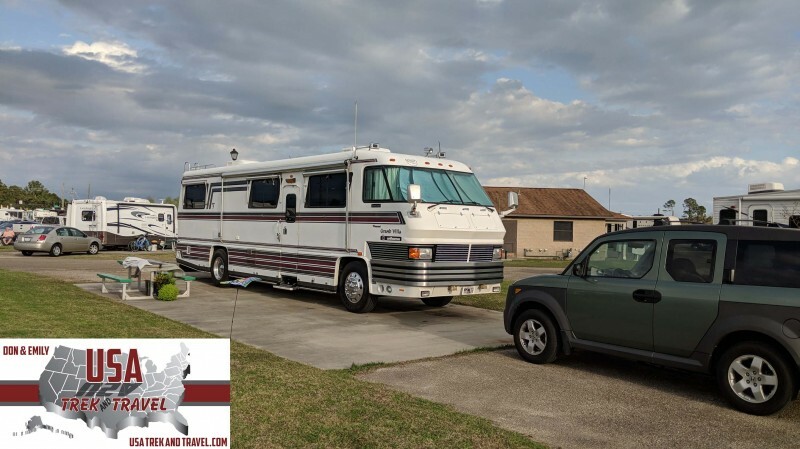 There is a new (additional) RV park being added on the back side of the base near SeaBee Lake, it's probably now open and in use by the time this is being written. It's a beautiful facility and seems like it'll be nice. I'm not sure why, unless it was because of space limitations, but none of the sites are pull-throough. That's workable, but why, oh why build a brand new site and not put in wifi and TV Cable??? Dumb! Storms... yeah, a couple were forecast and every time we were very firmly informed that the shelter for the park is the showers. AND then informed that dogs were not allowed in the shelter. ARE YOU KIDDING ME??? There is NO WAY anyone in that park was going to leave their animals in the RV and go to a shelter without them. Ain't gunna' happen! The prevalent sentiment of all we spoke with was, "My animals are going with me and she can kiss my ***." Hey Shields staff: We were staying at the camp on Maxwell AFE when a tornado was spotted. The base police came out and escorted all campers to the shelter and everybody's dogs were certainly welcome. Get with the program! This facility is awesome, Diana and Edward were very helpful and responsive to our needs. The bath house was clean and neat. The only drawback was the lack of shade. The afternoons were very hot and a shady area would have been a good respite from the sun. This is a great campground and everyone we've met has been helpful. The security force at the gate is the most pleasant, professional group we've seen. The directions were perfect. Most of the sites are pull through. The pad is concrete and has a picnic table. They do not allow slides to extend beyond the concrete pad over the grass. There is a nice laundry, a small commissary, exchange and gas station on base. The manager told me there are plans to build 35 more sites. There are some homesteaders in the campground, but their sites are not cluttered and look neat. The literature they gave me says there is a six month limit on stays but goes on to say they support active duty living in the campground and it sounds like there is no limit for them. This is off season here and the the CG is less than 50% full with most of those appearing to be long term. I'm sure it's very busy here in the winter. I did see a half dozen sites with signs saying they are for stays of 14 days or less. A great place to visit the local casino's. We did not stay here, just stopped in to check things out. It wasn't busy at all, only about a third of the sites were occupied. It was very quite and the campsites were neat but I'm sure that most of the RVers were homesteading. There is a small exchange and commissary on base and a Subway and that's all I need. I definitely would stay here. Good sites and paved roads. The rail tracks in the photos are not in use, but trains can be heard from other tracks about a mile away. The neighborhood has men who express their manhood with loud pipes and radios. Management is right in the center of the campground, no need to search for a remote MWR building. The base is compact. The bathhouse wa dirty upon arrival and not cleaned the 8 days we were there.